Lulu Chow Wang, one of the world's most influential women in investments and philanthropy, will address the members of the Wellesley College Class of 2016 and an international audience of their family and friends at Wellesley's 138th Commencement Exercises on Friday, May 27, at 10:30am. At Wellesley, the seniors select the commencement speaker; in keeping with Wellesley tradition, the students announced their choice of Wang, a 1966 Wellesley alumna, at the College's "Senior Soiree" on Thursday, April 7. Lulu Wang's leadership in philanthropy and her contributions to Wellesley are well known among students. Grace Park, senior class co-president and a political science and American studies double major from Irvine, California, said, "I'm inspired by how much Lulu Wang has given back—she has actively made such a difference—and I'm really excited to meet her in person. Lulu's contributions have had a big influence on us over these past four years." She added, "As an Asian-American, I'm also pleased that Lulu, an alumna, will be the first Asian-American to deliver commencement remarks at Wellesley." Senior Class Co-President Delia Arias De Leon, a political science major from Tampico, Mexico, echoed that sentiment: "I’m excited and honored to celebrate our commencement with Lulu. This year is also Lulu's 50th reunion, and I'm thrilled to share this moment in time with someone who has been so central to our lives." "Lulu Chow Wang is an innovative and trailblazing leader and a dedicated Wellesley alumna. As an enormously accomplished woman who is also one of Wellesley's foremost champions, she is an ideal person to speak at our commencement this year," said President H. Kim Bottomly. "I know Lulu will have the perfect words of inspiration for our students, and for all of us." Lulu Chow Wang was a pioneer on Wall Street and is a leader in women's philanthropy, recognized for changing the landscape of investments and challenging the long-held assumption that women do not give to charitable causes as generously as men. (The New York Times recognized Wang in 2013 as being in the vanguard of a new wave of philanthropy as an Asian-American woman.) She is the founder and CEO of Tupelo Capital Management, a leading New York-based investment firm. In 2000, Wang and her husband, Anthony, gave a record-breaking $25 million gift to Wellesley—at that time the largest gift ever given to a women’s college. The gift funded the design and construction of the College's campus center, where Wang sought to support “the creation of the strong bonds among students, faculty, colleagues, and alumnae that are one of the hallmarks of Wellesley College." Affectionately nicknamed "the Lulu," the center is beloved by students as the heart of campus. In "A Day in the Life of the Lulu," a short film by Alex Azzi '15, Lallie Lukens '14 says the Lulu is “where the community really comes together." Wang is a staunch advocate of investing in women and a believer in the transformative power of an all-women’s education. She speaks often about the effect that Wellesley had on her life: "I think Wellesley prepared me for finding my way and founding my own firm. The first, most important piece was the confidence I gained at Wellesley, the confidence that you could do it, believe in yourself, know that you are capable." In addition to that confidence, Wang says, the sense of community she experienced at Wellesley left an equally significant mark: "How important to be with other women who were smart, who were caring, who wanted to do their best but also do their best for their sisters." The story of Wang’s success was featured in an episode of the PBS documentary series Makers: Women Who Make America. An English major at Wellesley, Wang initially stayed at home after marrying, but increasingly she found herself missing the intellectual engagement she had experienced at college. She found a job as an editor and earned an M.B.A. from Columbia Business School, jumpstarting an astonishing career in the male-dominated world of investments. She also rediscovered the intellectual challenge she had experienced at Wellesley. "Once I started working, there was no looking back. I just loved it so much," she explained in the PBS interview. Wang went on to become executive vice president of Jennison Associates, where she managed $4 billion in assets, before founding Tupelo Capital Management. She named the firm after Wellesley's Tupelo Point, a favorite spot on campus and the setting for the College's Hooprolling tradition. 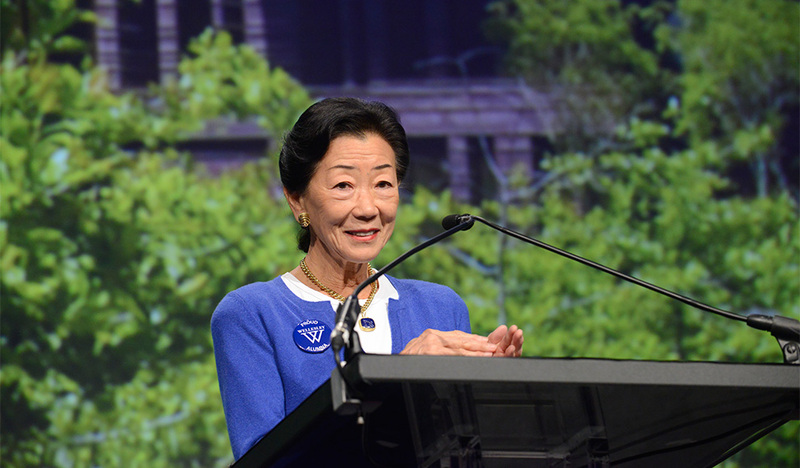 Wang has kept strong ties to Wellesley, maintaining a constant leadership presence at the College and serving as a member of its board of trustees for 18 years. She was the first woman to head the board's investment committee, which is in charge of investing the college's endowment. Her involvement in all three of Wellesley’s major fundraising campaigns has been crucial to the College's success. At the October 2015 launch of the $500 million Campaign for Wellesley, Provost Andrew Shennan said Wang’s dedication to the College "expresses with great conviction her belief in Wellesley’s mission and the imperative of investing in women and women's education as the surest way to improve the world." During the launch, the College announced a historic $50 million gift, given by Wang together with a fellow Wellesley graduate, to create greater opportunity for women in the 21st century and to empower the next generation of women leaders. This unprecedented gift—the largest ever given by women to their alma mater—set in motion an ambitious College to Career Initiative. Wang has received innumerable awards and honors. She was the first businesswoman to be honored at the Metropolitan Museum of Art's Corporate Dinner and the first woman to be honored at Asia Society’s Entrepreneur Dinner. She has also received recognition from Girls Inc., the New York Women's Agenda, the New York City Commission on the Status of Women, and the American Women's Economic Development Corporation, and from Ernst and Young for entrepreneurial achievement.